The harsh alarm sound that I’d almost forgotten the sound of echoes around the darkened room. My summer acclimatised eyelids and relaxed body attempts to awaken in the rush of the day, a steep change from the ‘jump into bed with me and lets have a cuddle and read a book’ mornings of the last 6 weeks. Book bags lie empty by the door ready for the year, crisp white polo shirts get buttoned up in haste, one, two, the third and final one a struggle through the new slightly stiff opening. The blue cardigan gets pulled over her ever growing arms and I double take at the oh so familiar colour but the unfamiliar badge. It’s a mad rush again and all of a sudden summer is forgotten in an instant and the mornings are filled with water bottles and attempts to stay calm whilst getting out of the door on time. 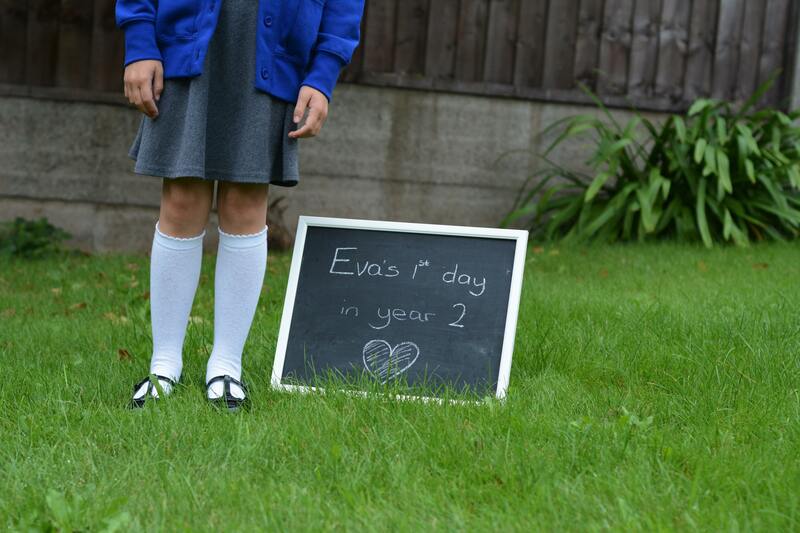 Along with most of the UK this week has meant one huge ordinary moment for us has returned, when Eva went back to school. 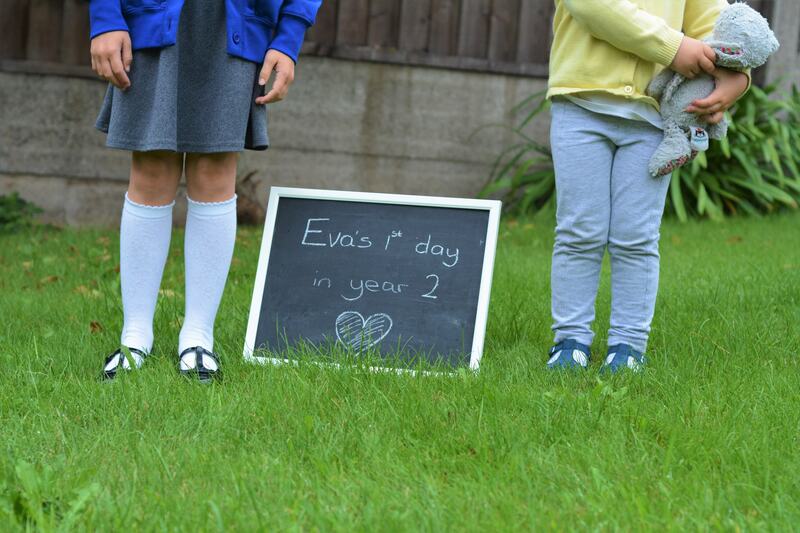 Except if you have been following my blog for a while or my social media you will know that not only is it the usual September return but she has started a new school altogether. 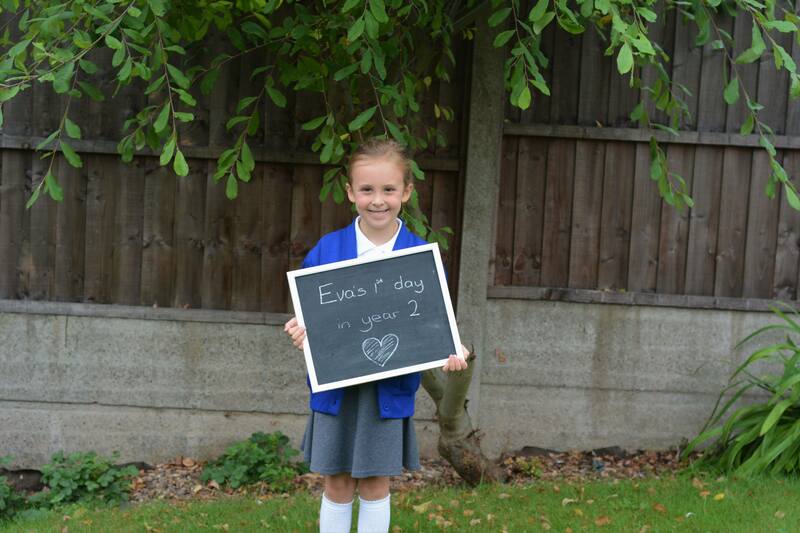 On Tuesday she entered year 2 not knowing a soul. I won’t pretend it has been an easy week, a combination of traffic issues and nervous tears going in means it has been a long week for everyone. I also won’t pretend that I don’t already dread each and every September as they roll around. I love the summer, I love having her at home and I love the fact that we make our own fun, have freedom to do as we wish and I don’t have to use all my physical energy on the school run or just getting through each day whilst only getting a few hours of tired Eva at each end of those days. As you can probably tell I do find it hard to adjust and pretty much live for the holidays and the weekends! 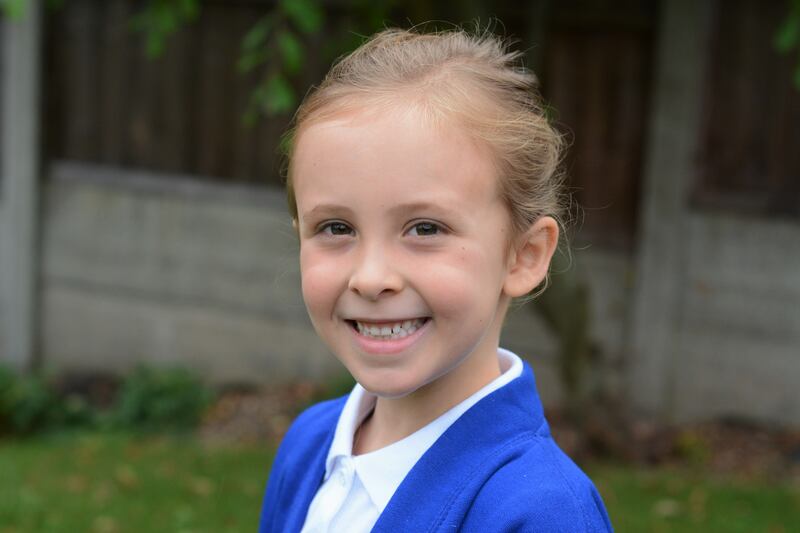 However, Eva was excited to start and despite the nerves and tears we have had this week she has walked in through those doors every morning with a little helping hand from her teacher and I am so so proud of her. 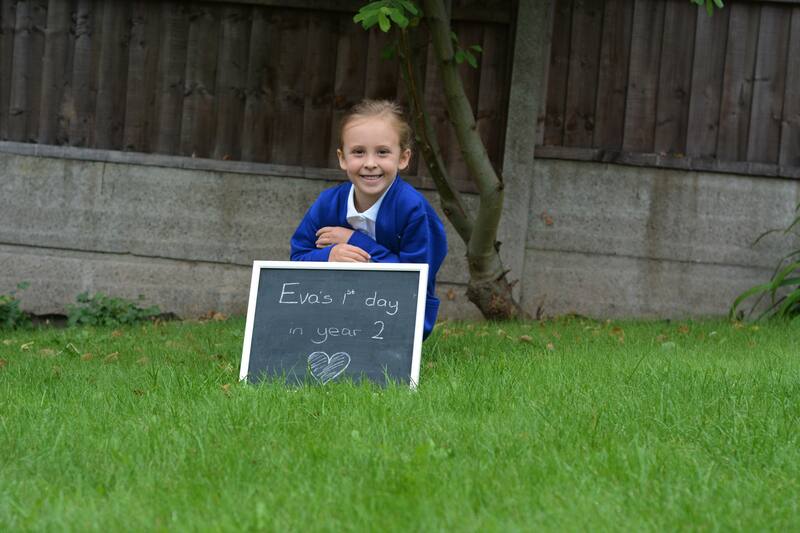 On her return she has seemed happy and talkative and I have so adored that after school cuddle. Every day she has come out seemingly happy and talkative telling me all about her school day. Both what she has done in class, what their topic is, what she has learnt and even what so and so said, what so and so had for dinner and who is friends with whom. It makes me laugh to think what she tells them at school as this little chatter box tells me everything about them so I am almost certain they all know our lives story. And the fact that Mum misjudged the times and the traffic and turned up for school a whole HOUR early one day. Not my finest parenting moment I will admit, although keeping two children entertained in the car for an hour and keeping them happy may well be! She may have spent some time on her own doing her own thing this week and she tells me she sat on her own a few times in the playground and read her book, but I have learnt that that is her, and that is ok. I have said it before but I love that she feels she can be herself, to sit back and assess the situation before jumping in and I am hopeful that soon she will be brave enough to make some friends, speak up and join in and who knows, feel just another member of the group. The irony that that scene on the other side of that classroom door looking in is strikingly similar is not lost on me and these four days of not knowing a soul has been hard on me too. There have been no “how was your summer” conversations, no “it’s like we were just here yesterday” or even sarcastic remarks of the friends I have made and know and love. We have talked alot this week about the fact that it is ok not to be ok. It is ok to be nervous, to recognise that feeling and to do it anyway because it is the best thing to do, to get through these days and know that with each one it will get better. As my words came out of my mouth I realised I was talking to me as much as I was talking to her because we truly are in this together. I think as children it is easy to think your parents are invincible, strong and know everything and of course I try to make Eva feel that because I want her to feel safe and protected. Yet I also show her the vulnerable side because it helps her to understand that no one is perfect, there isn’t a manual to life, everyone isn’t the same even as adults and that it is ok not to be ok. I want her to know that we can do this together and we have each others back, because believe you me I need her as much as she needs me right now and she will never realise how when she comes out of that school door and into my arms I am the most confident and comfortable I will ever be, not despite her but because of her. It might take her (and me) a while to settle in but with these 4 short days I still feel like we made the right decision and that maybe just maybe we will come into our own there really soon. Happy first week baby girl, I am so proud of you and don’t forget, we are in this together. This picture is particularly special because one of those little front teeth that filled her mouth and has been wobbly for what feels like forever actually sits under her pillow this evening ready for the tooth fairy to visit and in an instant it changed her that little bit more, forever. It does soon become the norm again doesn’t it? Beautiful post. 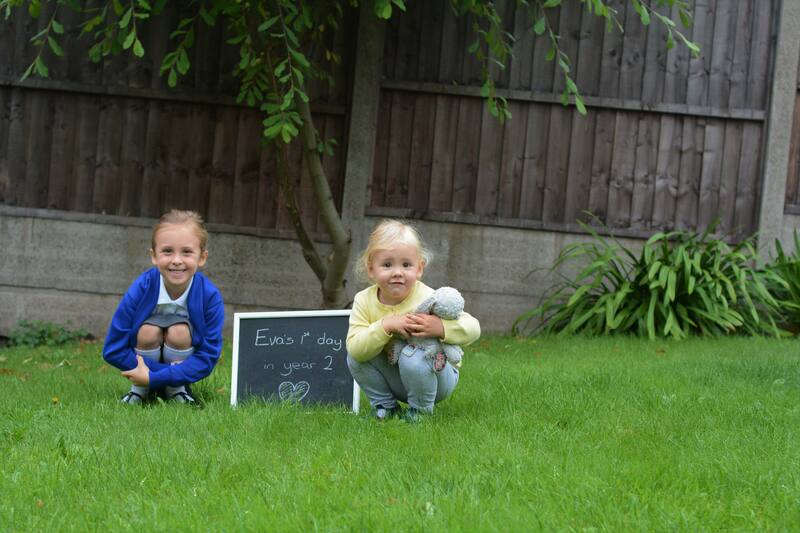 It is tough – our big girls seem very similar. Meme has gone into year 2 and she has some friends but I am expecting some I sat alone comments because that is just the way she is. She is very much a introvert like me. It is heartbreaking but I know she will find her own way as will your girl.